Have you or your child flourished from the education at METdance in the past? Are you a lover of dance? Are you a supporter of making the arts in Houston a s strong and diverse as possible? 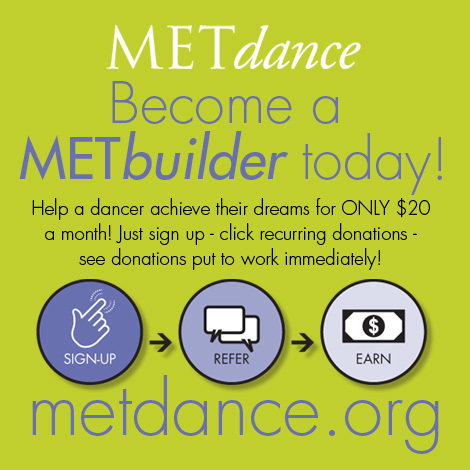 If the answer is “YES”, then please consider joining our NEW METbuilder Program and give back! A small reoccurring gift can make a vast impact in the long run. For just $20 a month, you can do amazing things over time. Be a building block of support to the longevity of our Children and Youth training programs, Professional company, educational outreach programs! As a METbuilder, you will receive the following! Recognition for your annual giving.